Sierra Leone has a reputation for being open and democratic, but on the issue of human rights and mining, few have spoken out. The brave Sallu Conteh was one of the few who did. 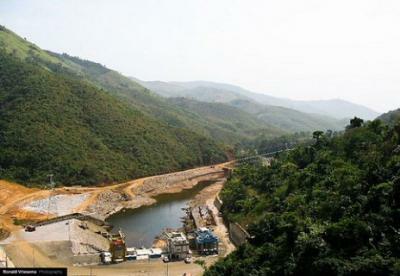 A hydropower station in Bumbuna, the town in which the AML strike took place. Photograph Ronald Vriesema. I first met Sallu Conteh in July 2012 while doing research in northern Sierra Leone on the impact that the mining company African Minerals Limited (AML) was having on residents and workers. AML is a British-based iron ore firm which began its operations in the country’s Tonkolili district in 1996, since which time it estimates it has invested $2 billion into the national economy. The mining sector as a whole is believed to contribute around 30% of Sierra Leone’s GDP, and AML, one of the biggest players in that industry, is the country’s single largest private employer. Conteh, a former soldier and air conditioning technician, had become one of those employees in 2006. On 16 April, 2012, however, he was one of a handful of individuals that led a strike against the company in the town of Bumbuna. The strike, which involved AML workers and contractors, erupted after the Sierra Leonean government denied workers the right to form a labour union of their own choosing. The mine workers had been concerned about uneven and inconsistent salaries, lack of payment for overtime, arbitrary termination, an inability to appeal, and discriminatory treatment on the job. AML employees took to the streets, but as they began their protest, about 200 police arrived in the town and opened fire. Both community members and police were injured in the ensuing mêlée, and one woman, marching with other women to call for peace, was shot dead. In the aftermath of the clash, Sierra Leone’s Human Rights Commission conducted a full-blown investigation, wrote a comprehensive report that said the incident resembled a “war zone”, and organised public hearings to which it invited key witnesses. Conteh was the only AML worker brave enough to testify. Two months after the hearing, Conteh was relocated to the capital, Freetown, with little advance warning. The company told him it was a promotion, but he wasn’t so sure. Then, on 20 May, 2013, one of Conteh’s relatives called me to say that he had died in a motorcycle accident on his way to Bumbuna. He had given her my number, and I shudder to think that it was because he sensed his life was in danger. I started to make calls and asked a journalist friend to investigate. Why was Conteh going to Bumbuna on a Saturday (18 May) when he no longer worked at the mine there and it was his day off? It emerged that the Paramount Chief in Bumbuna had asked Conteh to do some home repairs for him. Although Conteh told friends that he didn’t want to make the six-hour motorbike journey, the chief apparently insisted, and Conteh went, leaving Freetown at 4 pm. He stopped in Makeni, the regional capital, where he saw colleagues, before continuing his way towards Bumbuna. He spoke to his wife at 11 pm, which was the last anyone heard from him. His body was found in early the next day − Sunday, 19 May − lying in a swamp by the road. His skull was fractured. His jeans were torn. His phone was missing. His bike was not seriously damaged. The police, through its traffic division, immediately ruled Conteh’s death an accident. AML said it was conducting an inquiry, but later reported difficulty in establishing exact details, since it was not workplace-related. Civil society activists called on the Sierra Leonean police to investigate. The inspector-general of police said he was waiting for the relevant groups to follow up and “partner with” the police, who seemed to want financial support to conduct the investigation. In the end, it never happened. I thought about Conteh last month at a symposium in Freetown, where I was presenting my research findings on the role of government and AML in Tonkolili, and on Sierra Leone’s human rights and development challenges more broadly. I presented the Human Rights Watch report, which raises questions over AML’s alleged violations of human rights as well as the failure of the government − which consistently promotes the company’s operations as being essential to national development − to hold the firm accountable. As one of the world’s poorest countries, Sierra Leone certainly needs investment, and its mining sector is central to the economy, but my research found that key state institutions seem to have shown a lack of will, interest, or ability to ensure its citizens’ rights are respected. Sierra Leone’s Open Government Initiative, which is designed to improve the flow of information to the people and is housed in the office of President Ernest Koroma, hosted the event. I hoped for an open, frank, and constructive dialogue, but the government officials were largely dismissive, and the corporate representatives quite hostile. About 25 activists attended the meeting, but only a couple asked questions or offered comments. Most of the local reporters echoed the government’s and company’s posturing. Khadija Sesay, the director of the Open Government Initiative, was even threatened after the symposium for her involvement in it. One person who did make a statement was a journalist friend who had been jailed the previous week on the ludicrous charge of seditious libel after hosting a radio show in which a guest speaker apparently insulted the country’s vice-president. After an outcry, he was released. Sierra Leone has a reputation for being open and democratic, but it seemed that the only people who felt comfortable commenting on the Human Rights Watch report at the symposium were government and corporate officials. I don’t blame people for not publicly airing views critical of the authorities, given the potential for arrest or worse. But when I think of the stifled discussion and the malicious media commentary afterward, I remember Sallu Conteh’s quiet humility and stoic bravery. I know that if he had been there, he would have said something. Next Next post:Experts Weekly: How Can Africa’s Water and Sanitation Shortfall be Solved?